NUFC reporter names 5 ‘first-team’ players who could leave the club this summer – NUFC blog – Newcastle United blog – NUFC Fixtures, News and Forum. The Chronicle’s Chris Waugh believes Jonjo Shelvey, Isaac Hayden, Joselu, Mo Diame and Rob Elliot could all leave the club this summer – while he does not expect Kenedy or Antonio Barreca to return following loan spells. Rafa’s future at the club is undoubtedly the key matter that needs resolving as we approach the expiration of his current contract, but it sounds like several senior players could be heading out the exit door – whether he stays or not. ‘Rafa Benitez’s own future will ultimately determine this – but we do already have some idea of who could be leaving. 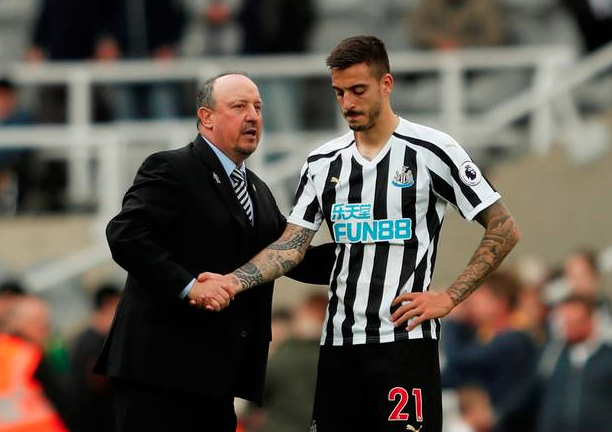 ‘Joselu is certainly among the senior players Newcastle will potentially look to offload, with the Spaniard often missing out on matchday squads and having been linked with a move in January. ‘Rob Elliot, too, is available for transfer – he was in January, as well – and, should Benitez stay, then the Republic of Ireland international simply does not have a future on Tyneside. ‘Antonio Barreca’s loan deal will almost certainly not be turned into a permanent transfer, while Kenedy will need to seriously impress during the final seven games of the season to convince Newcastle to pay Chelsea an inflated fee for his services. ‘Yet perhaps the greatest uncertainty surrounds the midfield – where up to three Magpies could find themselves leaving this summer. ‘First there is Mo Diame, whose contract expires at the end of the season and who has yet to activate the automatic one-year extension in his deal which triggers once he starts a specific number of games. ‘Diame wants a two-year deal, Newcastle would prefer him just to have a 12-month extension, and so he could yet leave on a free transfer. ‘Then there is Isaac Hayden who, despite being arguably United’s star performer in 2019 so far, is still desperate to depart to join his partner and daughter in the South West. Benitez has not given up hope of convincing Hayden to stay, but family is likely to come first in that regard. ‘Finally we have Jonjo Shelvey, who was once again linked with a move to West Ham United this morning. He is determined to fight his way back into the starting XI, but a significant offer this summer may entice Newcastle to sell. The key of course to all this is the future of Rafa himself – something that continues to linger as Ashley dithers. The current Toon boss clearly wants control of transfers and more investment before committing to a further stint at SJP – and if granted, a player shake up is inevitable. Shelvey would split opinion as he clearly has huge talent and Diame I feel is worth keeping for squad depth, especially as we look set to lose Hayden. The others will be considered dead wood by Rafa as he looks to push on next year – but as always, things are never straight forward at Newcastle under the current ownership. Benitez was this week voted the 37th best manager of ALL TIME by a French Football survey, so the idea our ‘board’ don’t always trust him to make decisions on player recruitment borders on laughable. Fabian Schar now ranked 3rd in all time Premier League list – Escapes unwanted record..
“I didn’t realise how good he was!” – Ex-Premier League boss now a big fan of this NUFC player..
Gents – nobody cares about speculative articles rehashed from Chronicle journos who know nothing!!. Agree on most of the list except Shelvey. BUT everything on the transfer front depends on two factors and two men Rafa & Ashley. Does Rafa stay? Will Ashley sell? We have so many rumours znd false dawns to actually believe what exactly is happening at Newcastle Utd. Rafa silent on his future until we are safe from relegation, which I understand. But Ashley is another problem entirely. He says one thing and does another. So unless we have someone who can actually see into the future and interprate the signs, we have no idea what the future holds.